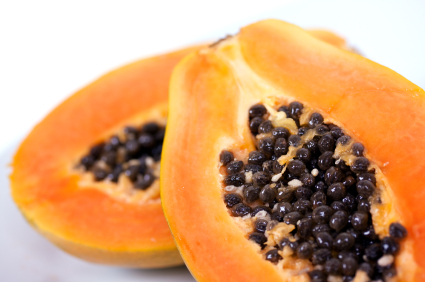 Not only are ripe papayas deliciously sweet, with a smooth, buttery consistency but are a powerhouse of cancer-preventing antioxidants such vitamin C, vitamin A and vitamin E. Other important nutrients found in papayas are folate, potassium and magnesium. Together, these nutrients are known to promote cardiovascular health and protect against certain types of cancer, especially colon cancer. Papayas are heralded as an anti-aging fruit that is an anti-inflammatory, helps beautify skin and, according to some studies, may even enhance male fertility. So eat on up! …except if you have a latex allergy. In that case, you might be allergic to the latex-like substance found in the papaya skin, especially when unripe. 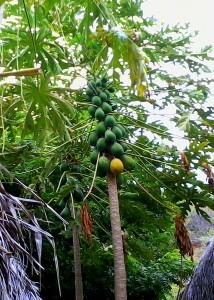 Nutritional value of a papaya. Taken from the World's Healthiest Foods website. In our household, we love papayas and have several female trees in our yard that produce big, delicious fruits (~16 inches or so). We also have some male papaya trees which although they don’t fruit nor are required for the female trees to fruit, nevertheless produce flowers that attract hummingbirds, which we happen to have a view of right outside our kitchen window. The way we most commonly eat papayas is to simply cut it lengthwise, remove the seeds and then eat it directly with a spoon. While most people throw out the seeds, they are actually edible, have a peppery taste and can be used as a substitute for black peppercorns, eaten whole or blended in creamy salad dressings. 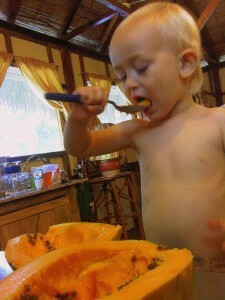 Our two-year old son probably likes papayas more than we do and currently refers to them as, “papapapa.” He also looks forward to the exciting process of knocking down a big, ripe fruit which requires one of us to bump it with a long stick while the other catches it below. In a medium bowl, mix mango, papaya, red bell pepper, avocado, sweet onion, cilantro, and balsamic vinegar. Season with salt and pepper. Cover, and chill in the refrigerator at least 30 minutes before serving. Enjoy!